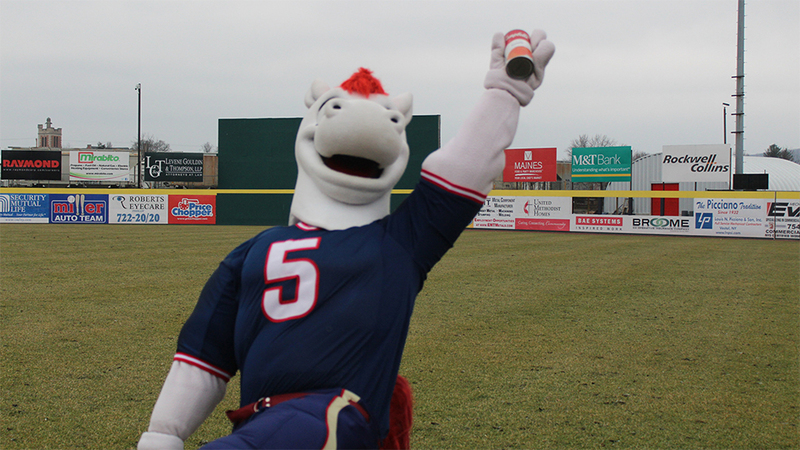 BINGHAMTON, NY - The Binghamton Rumble Ponies and United Way of Broome County are getting in the game during the NFL Playoffs for a "Soup"er Bowl Can Drive. Fans are encouraged to donate non-perishable canned goods including soups from January 25th - January 31st at The Armory Team Store at NYSEG Stadium. Fans will earn special store savings as well as two reserved grandstand tickets for any Monday-Wednesday April home game. For two cans, fans will receive 10% off their entire store purchase. Four cans will earn 25% off their entire purchase. Six cans will earn 50% off their entire purchase in the team store. All non-perishable items collected will be donated to the Southern Tier AIDS Program. Southern Tier AIDS Program's mission is to compassionately and competently meet the evolving needs of our communities by serving people affected by chronic illness and to improve public health through disease prevention, care coordination and advocacy. The Armory Team store will be open Monday through Friday 9:00 AM - 5:00 PM during the duration of the promotion. Some exclusions may apply, and the discount will not be combined with any other offers. The Rumble Ponies kick off the 2019 campaign under first year manager Kevin Boles on April 4th against the New Hampshire Fisher Cars. Rumble Club Memberships and Flex Books for the 2019 season are on sale now.